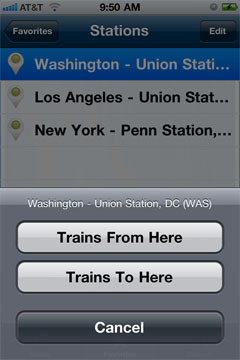 The Favorites screen is used to select Stations and Routes added to the Favorites previously. 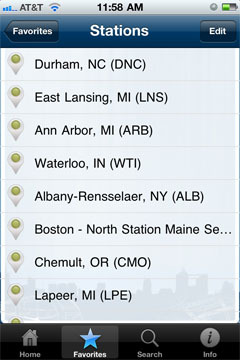 To learn how to add Station and Routes to the favorites see the Search documentation. 1. "Stations" Used to select favorite stations to use in your trip planning. 2. "Routes" Used to select favorite routes to use in your trip planning. The Favorites Stations screen displays your Station favorites. 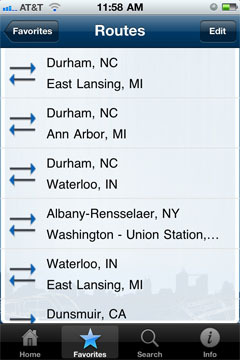 Select the station you wish to use in your trip planning. Then you will have the option to designate the station as the “From” or “To” station and transfer control to the Search screen. Tap the button to delete your favorites. 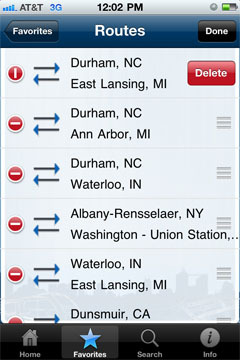 See the end of this page for information on deleting a favorite station or route. control to the Search screen. 3. "Cancel" Will remove the Favorites Screen Options. 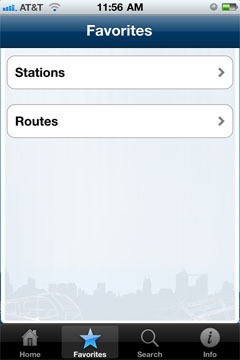 The Favorites Routes screen displays your Route favorites. Select the route you wish to use in your trip planning. This will allow you to transfer the route to the Search screen. 1. 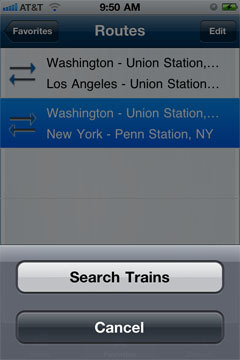 "Search Trains" tap button to transfer control to the Search screen. 2. "Cancel" tap button to remove the Favorites Options. The icon is used to display the delete button. The icon is used to hide the delete button. The button is used to delete the favorite.